I’m contemplating whether to do Easter baskets this year. 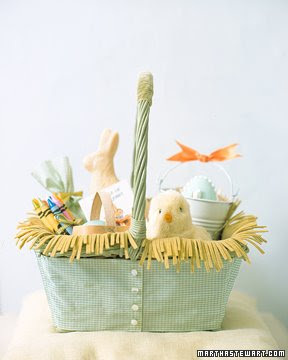 My kids are still young that Easter baskets can be filled with little toys and candy etc–nothing too big. But I don’t want my kids, as they get older, to think that Easter is a small version of Christmas. A basket filled with presents along side the chocolate eggs. I see that going on right now with my older sisters who have teenagers demanding a “good” Easter basket. Any suggestions? I’m thinking maybe making our Easter baskets a tradition of receiving a new book or something simple like that. The post Easter Basket? appeared first on Darling Darleen | A Lifestyle Design Blog .